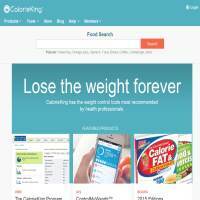 Calorie King is focused on helping you to lose weight by providing superior online community features, as well as plenty of advice and some useful tracking and monitoring tools. It provides a step by step system for calorie counting, plus some innovative apps for your mobile devices. The tools and apps are probably one of the best reasons to choose Calorie King over its peers. As well as the standard BMI calculator and calorie counter, you can also find out how many calories you should be eating and your ideal waist to hip ratio. You can browse food by category or search for a fast food restaurant on its index. Here’s a tip: in general, you probably shouldn’t be eating fast food if you want to lose weight. There are some interesting apps to use. The most useful (if you have type 2 diabetes) may be the HEALTHeDiabetes app, which is for iPhone. This helps you to check your food and plan your meals based on your particular health needs. Other apps include ControlMyWeight and a food search for iOS. Desktop software is also available in the form of a Nutrition and Exercise Manager for Windows and Mac OS X. This contains information on over 50,000 foods, a drag and drop interface, exercise and food diaries, plus you can set goals and more. Much of this is available on the site, but it’s nice to have the option of a desktop version. There are also books available to purchase. Calorie King costs just $49 a year, which is pretty good value for money. However, it would benefit from providing a few more hand-tailored options from professional sources such as gym instructors of nutritionists. Members seem to be quite happy with CalorieKing, finding that their weight has gone down and been maintained. This must be, at least in part, due to the community feel of the site. There are groups, forums and messaging options, as well as blog posts to help keep you interested in what’s going on. Calorie King has a lot to offer. Whilst it isn’t perfect, it has all the main tools you’d want, plus a few extras, and enough community activity to keep you going back.